What is The Open and Why Should You Do It? Home/Uncategorized/What is The Open and Why Should You Do It? Well, you can read the official CrossFit pitch here. It’s fun…in, you know, the CrossFit sort of way. 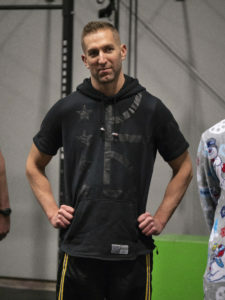 I made it out to one of the Open workouts at CF!nc last year and had a blast. There were kids running all over the place, food, music, people cheering, athletes throwing up in the corner (I kid, I kid). Taking a cue from many other gyms, we call it “Friday Night Lights”. It’s your chance to get on a stage and see what you got. The Open is just CrossFit with a little extra intensity. That’s fun, right? Okay, maybe not for everybody. But, everybody is welcome. Even if you don’t workout, come join and cheer your gym-mates on! You can do it! Just like our regular workouts, all the workouts have “Rx” and “Scaled” versions with varying standards across gender and age groups. I was more than a bit intimidated my first go-round last year but, once I got the first workout under my belt, I couldn’t wait to take a crack at the next one. Some workouts I did as prescribed, while others I scaled. In the end, I was proud of my effort more than anything. There’s my pitch. I’ll try not to beat any more people over the head in persuading them to do it (sorry, Evan), but over the next 30 days, we’ll be posting a brief profile on our athletes who have signed up for The Open – if you’re one of them and are willing to share your thoughts with the gym, let me know! Oh, and we need judges! No matter if you’re competing or not, anyone can be a judge. All you need to do is take a short online course. Let us know if you’re interested.